Asbestos comprises a group of fibrous minerals that are naturally occurring in the environment. Because of its natural properties, asbestos gained popularity for commercial applications in the late 19th century and was used throughout the majority of the 20th century, with predominant use in the construction, automotive, and shipbuilding industries. Asbestos has been linked to a spectrum of pulmonary diseases, such as pleural fibrosis and plaques, asbestosis, benign asbestos pleural effusion, small cell lung carcinoma, non-small cell lung carcinoma, and malignant mesothelioma. There are several mechanisms through which asbestos can lead to both benign and malignant disease, and they include alterations at the chromosomal level, activation of oncogenes, loss of tumor suppressor genes, alterations in cellular signal transduction pathways, generation of reactive oxygen and nitrogen species, and direct mechanical damage to cells from asbestos fibers. While known risk factors exist for the development of asbestos-related malignancies, there are currently no effective means to determine which asbestos-exposed patients will develop malignancy and which will not. There are also no established screening strategies to detect asbestos-related malignancies in patients who have a history of asbestos exposure. In this article, we present a case that highlights the different biological responses in human hosts to asbestos exposure. A 54-year-old woman with mild persistent asthma presented to pulmonary clinic with a chief complaint of chronic pleurisy. She had indirect exposure to asbestos from her father, who worked in a shipyard and had daily asbestos exposure. The patient’s mother did not have occupational exposure to asbestos, but would do her husband’s laundry routinely. As an infant, the patient would be next to her mother in a playpen while her mother did the laundry. The patient’s father had no sequelae from asbestos exposure, but her mother died from mesothelioma. The patient’s chest imaging showed densely calcified bilateral pleural plaques (figure 1). There was no pulmonary fibrosis or pleural effusion. Due to ongoing pleurisy, she was referred to cardiothoracic surgery and underwent robotic-assisted thoracoscopic pleural plaque excision with mechanical pleurodesis. Histopathology of the excised plaques showed dense fibrosis. Since that time, the patient continues to be monitored in pulmonary clinic for sequelae from asbestos exposure. Given the patient’s previous asbestos exposure and family history, the biggest concern is that she will develop mesothelioma. In the context of this clinical question, we review the various cellular, chemical, and molecular responses to asbestos exposure, the spectrum of asbestos-related disease, and the risk factors for developing asbestos-related malignancy . Chest imaging of patient demonstrating bilateral pleural plaques. Asbestos comprises a group of fibrous minerals that occur naturally in low levels in the air, water, and soil. Asbestos is predominantly divided into two groups, serpentine and amphibole, based on the characteristics of the fibers (figure 2). Serpentine asbestos contains the mineral chrysotile and gets its name from the curly, interwoven structure of its fibers. Amphibole asbestos is a mixed group of fibers that may contain actinolite, tremolite, anthophyllite, crocidolite, or amosite. Amphibole asbestos fibers are straight, needle-like, and more brittle than serpentine fibers, which limits its commercial applicability compared with serpentine asbestos.1 2 All asbestos fibers are chemically inert, durable, resistant to heat and fire, and do not conduct electricity. Because of these natural properties, asbestos gained popularity for commercial applications in the late 1800s, with predominant use in the construction, automotive, and shipbuilding industries. Due to increased shipbuilding during World War II, asbestos use increased substantially during the early 1940s. Electron micrograph highlighting the differences between the brittle, needle-like features of amphibole asbestos (crocidolite and amosite) versus the curly, interwoven serpentine asbestos (chrysotile) (downloaded from Google Images, original reference not available). The host of cellular and molecular effects induced by asbestos fibers are thought to lead to the broad spectrum of pulmonary diseases that affect the lung parenchyma as well as the pleura. Asbestos has been determined to be a causative agent in both benign and malignant lung disease. This includes pulmonary and pleural fibrosis, pleural plaques, benign asbestos pleural effusion (BAPE), and malignancy (bronchogenic carcinoma and malignant mesothelioma) (box 1). An in-depth discussion regarding each of these diseases is beyond the scope of this article; however, each of these diseases will be briefly reviewed. Pleural fibrosis and pleural plaques. Small cell and non-small cell lung carcinoma. Asbestosis is a form of interstitial lung disease that is characterized by diffuse and bilateral interstitial fibrosis.9 As with pleural fibrosis, there is a dose–response relationship between exposure to asbestos and risk of developing asbestosis. The latency period between initial exposure and the onset of disease is typically 15–20 years.9 The interstitial fibrosis is typically visible on chest X-ray, though in some cases the interstitial fibrosis is only visible by high-resolution CT scan (HRCT). Additional findings occasionally seen on HRCT in patients with asbestosis include cystic changes, parenchymal bands, honeycombing, and ground glass opacities (suggesting an ongoing inflammatory component to the disease).9 The diagnosis of asbestosis requires a history of asbestos exposure and the demonstration of interstitial fibrosis on chest imaging. In 90 per cent of cases, the diagnosis of asbestosis is made on these factors alone.9 The American Thoracic Society and American Medical Association currently recommend against lung biopsy if the sole reason to perform biopsy is to document the histopathological presence of asbestos fibers within the lung.16 17 Lung biopsy remains an important diagnostic tool if the etiology of the pulmonary fibrosis is in question. Asbestosis, pleural plaques, and pleural fibrosis are benign entities whose natural history is typically that of slowly progressive disease. Progression is associated with advanced age, more extensive occupational exposure to asbestos, tobacco smoking, and increased radiographic evidence of asbestos-related disease.18 Disease progression is typically manifested as worsening restrictive physiology and worsening impairment in diffusing capacity for carbon monoxide on pulmonary function tests.9 Clinical symptoms and signs of progressive disease include increasing dyspnea with exertion, declining exercise capacity, crackles on lung auscultation, fingernail clubbing, and development of hypoxemia necessitating the use of supplemental oxygen. At the present time, no specific pharmacotherapy exists for pleural plaques, pleural fibrosis, or asbestosis. No clinical trials have been performed to evaluate the role of specific therapies for these diseases.9 The current hallmarks of therapy include tobacco smoking cessation, early identification of disease to prevent any further occupational asbestos exposure, use of supplemental oxygen if hypoxemia is present, early treatment of respiratory infections, and vaccination against influenza and pneumococcal pneumonia. Malignant diseases associated with asbestos include small cell lung carcinoma, non-small cell lung carcinoma (collectively referred to as bronchogenic carcinoma), and mesothelioma. Malignant mesothelioma arises from mesothelial cells in the pleura, peritoneum, pericardium, and tunica vaginalis. Risk factors for developing mesothelioma will be discussed separately. Mesothelioma remains rare in the general population, with an estimated annual incidence of death of 1.75 per million in the USA between 1987 and 1996.4 The prognosis overall remains poor, with limited treatment options available. Further discussion about bronchogenic carcinoma is beyond the scope of this review. Asbestos exposure can occur through inhalation, ingestion, or dermal contact, with inhalation being the most prevalent and clinically significant route of exposure.4 There are five mechanisms through which asbestos fibers deposit in the respiratory tract: impaction, sedimentation, interception, electrostatic precipitation, and diffusion. Impaction and sedimentation are dependent on the diameter of the fiber, interception is determined by the length of the fiber, and electrostatic precipitation is due to the electrical charge of the fiber.9 Amphibole fibers, which are uniform in distribution and arrangement, align parallel to the axis of airflow and typically deposit in alveolar ducts. Serpentine fibers, which are heterogeneous in arrangement, have a mixed flow pattern and will usually deposit in airway bifurcations.9 Fibers that land in ciliated portions of the airways are typically removed via the mucociliary escalator and do not result in lung injury.4 While all types of asbestos may have deleterious health effects, amphibole asbestos is thought to be more harmful to human health than serpentine asbestos.1 The precise mechanisms to explain fiber toxicity are poorly understood and may be a consequence of the differential deposition pattern, surface reactivity, or biodurability of these fibers. In addition, genetics likely play an important role in disease development. Generation of reactive oxygen and nitrogen species. Alteration of cellular signal transduction pathways. Loss of tumor suppressor genes and activation of oncogenes. Direct and indirect DNA damage from asbestos fibers is thought to be an important pathogenic pathway leading to mesothelioma. When mesothelial cells engulf asbestos fibers, the fibers can penetrate the nucleus and directly interfere with mitotic spindles and chromosomes. The interwoven complex of mitotic structures and asbestos fibers results in impaired mitosis, with structural chromosomal abnormalities and aneuploidy.31 As mentioned above, additional indirect DNA damage and DNA strand breakage may occur through asbestos-induced generation of ROS. Asbestos-induced impairment of various arms of the immune system is thought to be an important factor in malignant transformation. Studies in mice have shown that asbestos exposure decreases the cytotoxic activity and the overall number of natural killer (NK) cells in the pulmonary interstitium.43 Decreased activity of NK cells and an increase in NK cell number was seen in the peripheral blood of retired asbestos cement workers without symptomatic lung disease, while decreased cytotoxic activity of NK cells in humans with asbestosis has been observed.44 45 Several human studies have shown increased serum levels of immunoglobulins in asbestos-exposed subjects. Mouse studies have shown that genetically immunodeficient mice show higher numbers of cells (predominantly neutrophils) in pulmonary lavage fluid along with increased severity of pulmonary lesions after asbestos inhalation compared with immunologically normal mice with the same exposure or genetically immunodeficient mice that have been reconstituted with lymphocytes.46 It is possible that genetically determined ‘robustness’ of the immune system is an important determinant in the observed variability for disease development after asbestos exposure. 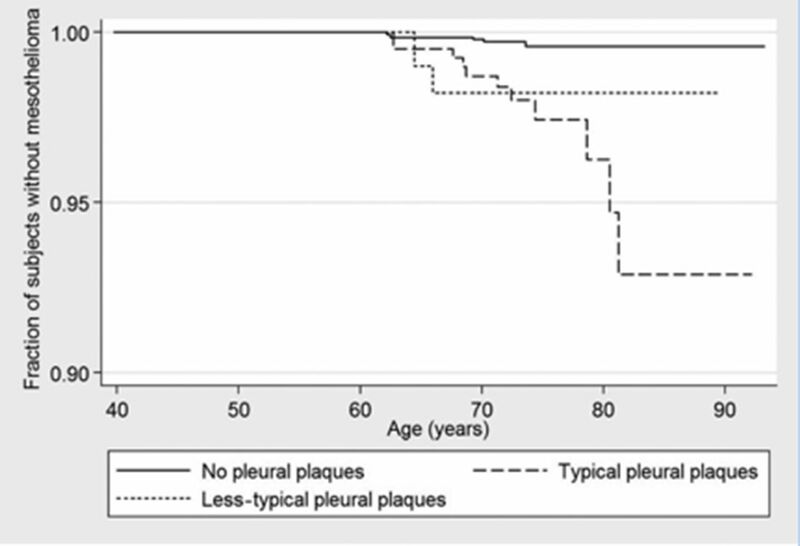 Proportion of asbestos-exposed individuals without mesothelioma at any given age stratified by presence or absence of pleural plaques (Pairon et al)53. Better screening methods will likely rely on advanced understanding of asbestos-induced malignant transformation. While imaging has traditionally been used to evaluate for mesothelioma, serum biomarkers are an emerging modality that may be useful in monitoring asbestos-exposed patients for mesothelioma. These biomarkers include mesothelin-related protein, osteopontin, and megakaryocyte potentiating factor.54 Serum osteopontin levels have been shown to distinguish asbestos-exposed individuals without mesothelioma from asbestos-exposed individuals with mesothelioma in one study.55 Other studies have shown osteopontin to have poor specificity for mesothelioma.56 In various studies, soluble mesothelin family proteins have shown good specificity for mesothelioma, but poor sensitivity.56 While these biomarkers hold promise, they have limitations. Further work is needed to validate these biomarkers, establish cut-points that optimize sensitivity and specificity, and define the role of combining different biomarkers as well as imaging to screen for mesothelioma. Further research objectives should include the development of screening tests and strategies that identify patients at higher risk of developing asbestos-related malignancy and early biomarkers of disease development.
. Respiratory illness in the construction trades. J Occup Med 1985;27:483–9.
. Pleural plaques and lung function in construction workers exposed to asbestos. Eur J Respir Dis 1981;62:111–22.
. In: Schwarz M , King T , Interstitial Lung Disease. 5th ed. USA: People’s Medical Publishing House, 2011:543–55.
. Deposition and clearance of inhaled fibrous minerals in the rat studies using radioactive tracer techniques. Environ Res 1975;10:196–207.
. Topographic distribution of asbestos fibres in human lung in relation to occupational and non-occupational exposure. Inhaled Part 1975;4 Pt 2:435–46.
. The diagnosis of nonmalignant diseases related to asbestos. Am Rev Respir Dis 1986;134:363–8. Affairs COS. A physician’s guide to asbestos-related diseases. JAMA 1984;252:2593–7.
. Monosymptomatic exudative pleurisy in persons exposed to asbestos dust. Scand J Respir Dis 1975;56:263.
. Patterns of inflammation, cell proliferation, and related gene expression in lung after inhalation of chrysotile asbestos. Am J Pathol 1995;147:728–39.
. Progressive lung cell reactions and extracellular matrix production after a brief exposure to asbestos. Am J Pathol 1988;131:156–70.
. Crocidolite asbestos fibers undergo size-dependent microtubule-mediated transport after endocytosis in vertebrate lung epithelial cells. Cancer Res 1991;51:4942–7.
. Iron-catalyzed reactions may be responsible for the biochemical and biological effects of asbestos. Biofactors 1991;3:83–9.
. Induction of c-fos and c-jun proto-oncogene expression by asbestos is ameliorated by N-acetyl-L-cysteine in mesothelial cells. Cancer Res 1995;55:2085–9. Contributors Both authors conceptualized, wrote, and revised the article. ES is the guarantor of the article and performed literature search.